Many of our monumental buildings on Capitol Hill were designed and constructed using classical orders of architecture. When designing and constructing the U.S. Capitol Visitor Center (CVC), we were challenged to design and construct a building using modern materials and technology that is a respectful addition to the historic U.S. Capitol. One prevailing philosophy in architecture is that a building should reflect the time and values in which it is built. When making additions to historic buildings, we are not to copy or try to match the historic building, but rather we are to differentiate the new features so we don't create a false sense of history. New should look new and old should remain old. When connecting to a historic building, an addition should have some subtle and respectful ties to that building. Take in the sandstone walls. That material isn't normally used today, but mimics the Rotunda in the heart of the U.S. Capitol. 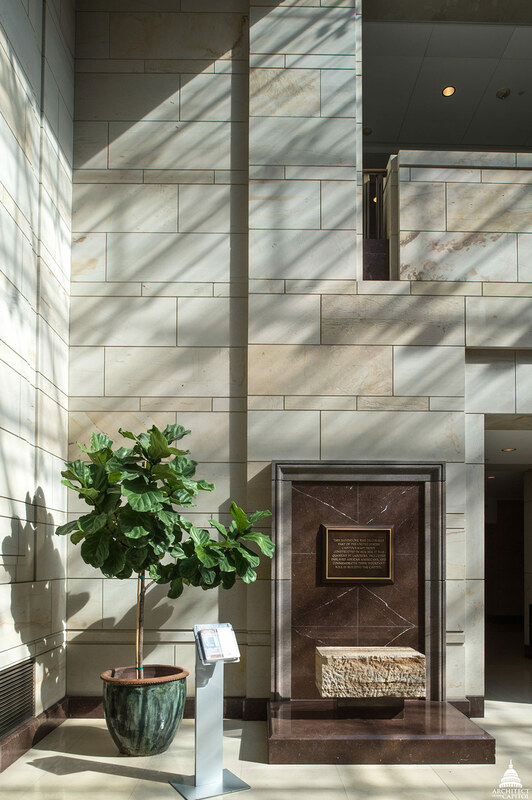 The stone colors surrounding the doors in the Rotunda were replicated in many areas in the CVC to link it to the U.S. Capitol's original construction materials. Identify the inset grout lines in all the wall stone. Every third course of stone is marked by a thin band, which serves to emphasize a linear and more modern appearance of a steel frame and stone clad building. Examine the two Doric columns that visually support the entrance to Exhibition Hall. They were replicated from the Crypt. Look at the tall piers in Emancipation Hall, holding up the roof like classical columns, which have the slightest hint of a column capital on them made from a simple band of stone. Notice the skylights, which allow natural light to bathe interior spaces. They frame dramatic views of the Capitol Dome, helping visitors maintain an orientation to the historic building, while reinforcing their connection to the U.S. Capitol. Even the exterior was designed to carefully integrate with the landscape of the historic U.S. Capitol Grounds, originally designed by Frederick Law Olmsted in 1874. The skylights are only slightly above ground level as not to intrude upon or compete with the U.S. Capitol façade. The CVC was designed to be respectful to the architectural style and texture of the U.S. Capitol. A simple, yet powerful, sign of respect for the classical orders. Or better yet, the classics interpreted in a fully modern way.